A true Fijian experience away from the major tourist areas, relax in paradise at this truly idyllic resort offering an island experience with mainland convenience. Located in Rakiraki on the northern tip of Viti Levu, this island paradise is just a 2 and ¼ hour journey from Nadi International Airport. Perfect for everyone from honeymooners to families; enjoy luxurious traditional Fijian bure accommodation, sumptuous cuisine, pampering spa treatments, and world-class diving in the Bligh Waters. Each beautifully decorated Bure offers modern facilities, a private deck, wood floors, ensuite with minibar, and air conditioning. There is no TV, radio or CD player. Garden View Bures - Set amongst the lush, tropical gardens, 4 One-Bedroom Bures sleep 2 guests in a Queen Bed and 1 Two-Bedroom Bure sleeps up to 4 guests in a Queen and 2 singles. A 3rd guest can be accommodated in the One-Bedroom Bures with an extra bed. Ocean View Rooms - Situated in the main complex, the Ocean View Bures offer views of the Nananui Islands. 14 One-Bedroom Ocean View Bures sleep 2 guests in a King Bed. Some Bures can accommodate twin sharers and a 3rd guest can be accommodated in some bures with an extra bed. Ocean Front Bures - Located on the beach, 8 One-Bedroom Beach Front Bures sleep 2 guests in a King bed. Some of the Bures can accommodate a 3rd bed. Two-Bedroom Beach Front Villas are also available. Honeymoon Bures – Features a private plunge pool, a separate deck, a large lounge, a King-sized canopy bed and indoor and outdoor showers. 3 Ocean View Honeymoon Bures sleep a couple in a King bed. Villa Vanua - The ultimate in Fijian luxury, sleeps up to 10 guests in 4 large bedrooms with a full kitchen, state of the art audio-visuals, intricate traditional wood and twine work, a 10 metre pool, and magnificent views. Experience world-class diving in the pristine, nutrient-rich Bligh Waters. This amazingly abundant marine environment was once only accessible by liveaboards, but is now available by 15 to 70 minute boat rides (15-30 minutes to local dive sites and 45-70 minutes to the Vatu-I-Ra Passage). With an incredible variety of sea life from the tiniest of creatures to large pelagics, from hard coral to hanging soft coral gardens, Bligh Waters is known as one of the top diving locations in all of Fiji. Dive Wananavu (operated by Ra Divers), PADI Gold Palm Certified team, runs three boats from the wananavu marina, with a total capacity for 36 divers. From beginners to braggers, there's something for everyone at Dive Wananavu; from the thousand fish frenzies of Sailstone Reef to the awe inspiring soft coral and big, big fish of the bligh waters. Sailstone Reef with 20+ sites is 10-15mins by boat. Soft coral galore with critters, pelagics, sharks, turtles, rays, and more! 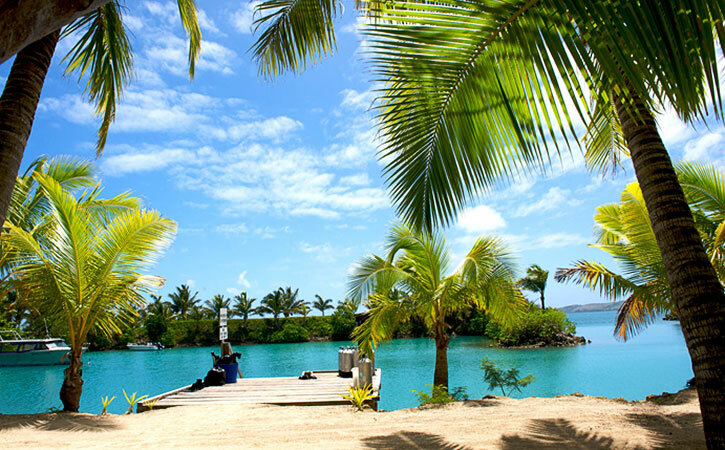 Great Dive Packages are also available at Wananavu!